Over the the last several months, I repeatedly have been asked what a Justice Kavanaugh would mean both for PLF cases specifically and the law in general. Now that the possibility has become reality, let’s consider the answers to those questions and a few other questions posed by his recent Senate confirmation. Perhaps most important to PLF in the short run is what his role on the Court may mean for our cases Knick v. Township of Scott and Weyerhaeuser v. U.S. Fish & Wildlife Service. Both cases were argued last week to an eight-justice Supreme Court before the Senate voted to confirm him, and the justices have any number of options before them now that the cases remain pending and he has joined the other eight. One alternative: both cases are decided by the eight justices who heard the cases, and that is that. In that scenario, Justice Kavanaugh would have no impact. No muss, no fuss. Alternatively, despite the fact that Justice Kavanaugh was not on the Court for the two arguments, he could nevertheless participate in their resolution as a voting member of the Court on one or both of the cases. No less an authority than former Solicitor General Paul Clement noted that possibility at our PLF/National Review Institute Supreme Court 2018 Term preview held late last month. That may be a possibility, but it would be a surprise and a departure from practice, as General Clement explained. It is true that, towards the end of his tenure on the Court, Chief Justice William Rehnquist voted in some cases without participating in the oral arguments, and that could be in a sense a sort of precedent for Kavanaugh, at least broadly speaking. But there Rehnquist missed the oral arguments because of necessary medical treatments, and he of course had been on the Court for decades when he missed those oral arguments. Those facts are certainly different from the facts here. Another path forward for the Court? Reargument. Famous cases of the recent past (Citizens United) and not so recent past (Roe v. Wade) both were argued twice to the High Court. In a true curiosity of its time, Lewis Powell and the aforementioned Rehnquist both were confirmed by the Senate to their seats on the Supreme Court before the first argument in Roe v. Wade, which was originally argued to a seven-justice Court on December 13, 1971. Justice Powell won Senate confirmation on December 7, 1971, and then-Justice Rehnquist won his confirmation on December 10, yet neither were sworn in as justices until January 1972. 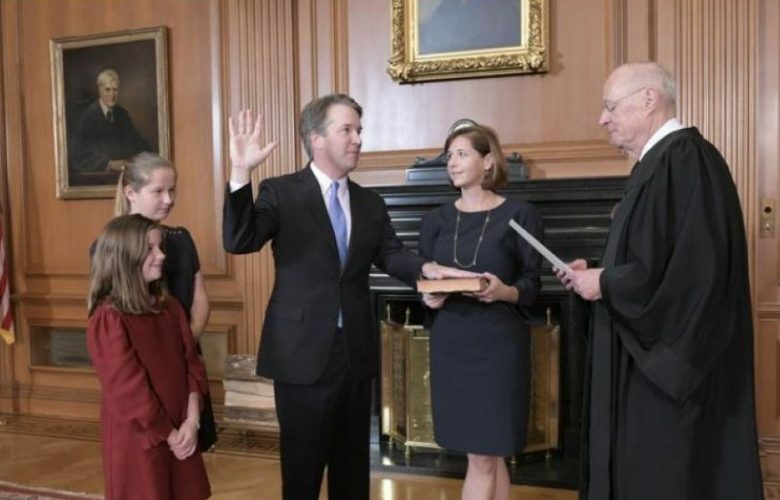 Compare those slow walks of two swearings-in to Justice Kavanaugh’s confirmation and swearing-in: he was confirmed this past Saturday afternoon and sworn in later that evening. Long story short, reargument is anything but outside the realm of possibility—some of the most important cases of the last 50 years have been reargued, and there is no reason why the Court could not opt to hold re-argument with a full court in either or both the Knick and Weyerhaeuser cases, should the Court see fit. It is not even required that the justices be evenly divided for the Court to opt for a reargument; the seven-justice Court in Roe was not evenly split, yet it decided to hold reargument in the case, anyway. While all this is true, we believe we have the better legal arguments in both cases and do not expect the Court to need to resort to reargument to resolve them. That addresses PLF’s two pending cases, but what about the broader impact Justice Kavanaugh may have on the Court’s practice and jurisprudence? In regard to its practice, a full complement of justices makes certain procedural aspects of Supreme Court practice simpler and more readily accomplished. For example, the Court only agrees to hear most cases if four justices agree to hear the case on the merits. That is known as the “Rule of Four.” It is certainly a bit easier to obtain the four votes of nine justices rather than eight, if for no other reason than simple math. But in fact there are more reasons to think that it is easier to win four votes to hear a case out of nine rather than eight. For example, justices who otherwise want to take a case may demur because the uncertainty of the future ninth justices’s opinion of that matter. In other words, the risk may not be worth the reward to the justice considering whether to vote to grant certiorari and hear a case. That concern is obviated with the ninth justice in place. Another procedural matter made easier going forward by Justice Kavanaugh’s appointment: it takes five votes to decide a case with a meaningful outcome and winning five votes from nine is easier than from eight, just as it is easier to meet the Rule of Four to hear a case with nine seated justices. Finally, what kind of difference at One First Street will Justice Kavanaugh make on substantive law? Predictions are a tricky business. But it’s fair to say that, in the D.C. Circuit Court of Appeals, Judge Kavanaugh demonstrated a jurisprudential interest in requiring executive agencies to stay within their lawful authority and not take on Congress’s job of making law. I would expect that Justice Kavanaugh will continue to adhere to that approach to administrative law. That will not cause PLF to bring different cases, as for many years we have pursued cases that make this very point. But it may mean we find even more success at the High Court and perhaps more importantly in the lower courts, where the federal appellate and trial judges apply to new cases the precedents that the Supreme Court expects them to follow. We can also expect that Justice Scalia’s textualist approach to statutory interpretation will become even more entrenched at the Supreme Court. In Kavanaugh’s review of Judge Robert Katzmann’s book, Judging Statutes, Kavanaugh sets out how he sees the proper role of the federal judge: “to be sure, some may conceive of judging more as a partisan or policymaking exercise in which judges should or necessarily must bring their policy and philosophical predilections to bear on the text at hand. I disagree with that vision of the federal judge in our constitutional system. The American rule of law, as I see it, depends on neutral, impartial judges who say what the law is, not what the law should be.” That approach mirrors Justice Scalia’s approach, and it represents a dramatic change from the legal model taught by the American law academia for decades. It is Congress’s job to write the law and make the policy decisions for the nation, not the Supreme Court’s job. If Kavanaugh follows through on that comment as a Justice of the Supreme Court, then the nation will be the better for it.